I really enjoyed Lynda Mullaly Hunt's One for the Murphys so much that I added it to the suggested reading list for this summer. 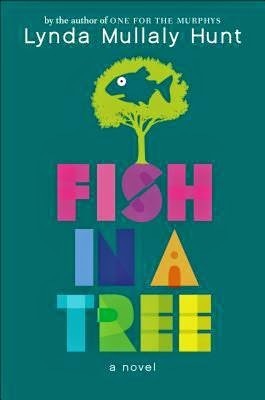 I've been eager to check out her latest, Fish in a Tree, for awhile. I was not disappointed and am excited to see where she goes next. Ally has somehow made it to sixth grade without anyone realizing her big secret: she can't read or write. Leaving aside the implausibility of this (my kids are overly tested), it seems like sixth grade would be another year that she would slip through the class. Until Mr. Daniels showed up to cover her regular teacher's maternity leave. With his wacky ties, his nickname for the students "Fantasticos," and his genuine caring, Mr. Daniels refuses to let Ally slide. His goal is to convince her that she is smart, and slowly, she starts to believe it. Fish in a Tree felt like Because of Mr. Terupt, but with better writing. At times, I thought the book might have been written for pre-service teachers, with all the explicit strategies for teaching dyslexics clearly spelled out. But when Mullaly Hunt lists all the famous people who have had dyslexia, I know it's geared towards middle grade students, as most adults are familiar with that list by now. I know exactly the students in my class that need to read this novel. I'm excited to suggest it to them.